Luxembourg is located in Western Europe and shares northern and western borders with Belgium. Luxembourg also borders France to the South, and Germany to the East. Luxembourg is a member of the Schengen Agreement. As such, citizens of other Schengen countries to Luxembourg do not need a visa. Travelers from non-Schengen countries face stricter rules when entering Luxembourg. Visitors from outside the EU or Schengen area are required to apply for a visa. The visa can be obtained by applying through any Luxembourg embassy. Passengers older than 17 years old and arriving from non-EU locations are allowed to bring without customs duty 200 individual cigarettes, 100 cigarillos (max. 3 grams each), 50 cigars, 250 grams of smoking tobacco or proportional assortment 1 liter of spirits over 22%, or non-denatured ethyl alcohol with more than 80% volume, 2 liters of spirits or aperitifs made of wine or similar beverages less than 22% volume, or sparkling wines or liquor wines, a proportional mix of these products; and in addition, 4 liters of wine or 16 liters of beer, medicines in proportion to the traveler's needs (for all passengers), and other goods (for air travelers), up to a total value of EUR 430 per adult or EUR 150 if aged under 15 years old. Passengers who purchased items within EU countries are allowed the free import of, 800 individual cigarettes, 400 cigarillos (max. 3 grams each), 200 cigars or 1 kilogram of smoking tobacco, 10 liters of spirits over 22%, 20 liters of alcoholic beverages less than 22%, 90 liters of wine (though no more than 60 liters of sparkling wine) or 110 liters of beer. My tour of Luxembourg was more than I expected. I used the Turkish Airlines from JFK Airport (New York) on a business class ticket. The crew was helpful, although I didn’t get my preferred seat because I used a code-share ticket flight (minor flaw though). We reached Fidel Airport, Luxembourg at around 4 pm. Moving around the city was easy. I bought 1 public transport ticket each day. I was able to cover most of Luxembourg City with a single ticket. Amazingly, the ticket was valid for use as a train ticket or a bus ticket. The tour of Luxembourg couldn’t be any better! It was a great trip to see all the castles in Luxembourg. I flew on a promotional ticket with Luxair from Nice to Luxembourg. Moving from one district to the other was possible using one ticket. The bus ticket/ train ticket was also quite affordable. My wife and I had a terrific experience in Luxembourg. We traveled as a group from Melbourne via Swiss and Singapore Airlines. Ticket inspection took some time due to the high number of travelers. The crew in both airlines made our flights easy and enjoyable. Among other places, we visited the Cathedral Notre Dame, Barrio Grund, and Larochette Castle. Q. What are the best places to visit in Luxembourg? A. 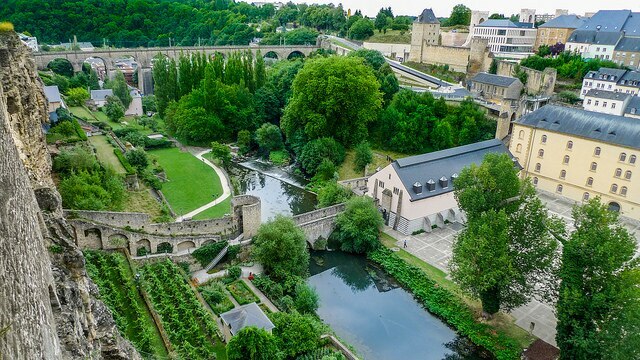 You will need more than 1 day to visit all the tourist destinations in Luxembourg City alone. The Notre Dame Cathedral is an iconic site to visit. It is at the heart of the city and easily accessible from most hotels. This monument was built in 1613, and it has lots of tombs where most of the royal family members of between 1310 to1346 were buried. Other places of interest include the Grand Duke Jean Museum, Crossfire, Natural History Museum, and the Casements du Bock. Q. When should I visit Luxembourg? A. Luxembourg has an incredibly moderate climate with minor differences in seasons. Tourism in Luxembourg is most popular between mid-April and mid-October. There are lots of tourists around this time. Airports handling direct flights to Luxembourg Fidel Airport • Luxair (Charles de Gaulle Airport) • Luxair (Nice Cote d’Azur Airport) • Hop! (Lyon-Saint-Exupery Airport) etc. Luxembourg City alone has 3 major airports that offer both domestic and international flights. From Luxembourg, direct flights to London-Gatwick, Porto, Lisbon, Manchester, Lyon, Dusseldorf, Warsaw, Amsterdam, Geneva, Barcelona, and Vienna are available. Direct flights to and from several American airports including Dallas, Chicago, Miami, Boston, Seattle, San Francisco, Philadelphia, and Houston are offered.